It’s been a tough & emotional year for this man, but we are grateful to have him back gracing our little doo in Barnet. Ladies & gents, make some noise for Nicky Holloway! A friend of Weeksie & to all the Soulstice Crew, Nicky’s been with us since our first event back in 2007. He holds a legendary status in both the UK & internationally with his DJ explots & club nights over the years. 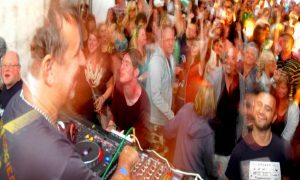 He is one of the ‘Ibiza Four’ alongside Paul Oakenfold, Danny Rampling & Johnny Walker, who with Argentine DJ Alfredo created the Balearic chic that was to change the face of clubbing forever. In 2017, Nicky was diagnosed with prostate cancer & is currently undergoing treatment to help him battle the disease. He’s battling it well & receiving groundbreaking treatment in Prague. To show us all that he’s in great shape & back to the Nicky Holloway we all love & know, he promises to deliver yet another memorable Club Tent finalé at this year’s Summer Soulstice 2018.